This is the biggest and best known of all the Lake Garda theme parks. Gardaland is a Disney-style park located just north of Pescheira del Garda, and there is even a free bus service (going every 30 mins) to and from Gardaland from the railway station there. The park opened in 1975 and has grown since, now getting over 3 million visitors per year! It caters to 'just walking' age and up, and you can hire pushchairs for 5.00 euros. Did you know that on really hot days, there is water sprays where the queues are and at various other spots around the park? So you can enjoy yourself and keep cool at the same time! There is lots to do at Gardaland, including roller-coasters, water rides, safaris, play areas, shows, and tons of places to eat. 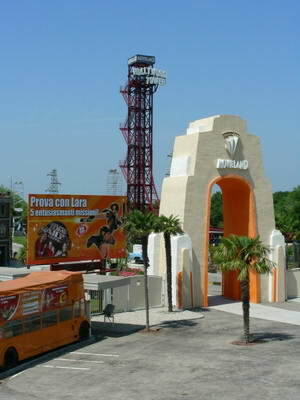 New features are added all the time to maintain their reputation as Italy's largest and most popular themepark. For the year 2007, Gardaland's opening hours and prices are as follows: Open from 31st March to 21st June, and 10th September to 30th September 10am to 6pm. From 22nd June to 9th September it's open from 9:30am to midnight (by the way, I'd like to note here that during this time if you buy a ticket in the morning, it will be valid until midnight; you don't have to purchase an evening ticket seperately). Open during the weekends in October and also from 31st October to 4th November for 'Magic Halloween', from 9:30am to 6:30pm. Open on 8/9, 15/16, 22-24, 26-31 December and again on 2-6 January 2008 for 'Magic Winter' 10am to 6:30pm. Prices are 27.00 euros per day for ages 10+, 23.00 euros for children under 10 and over 1 metre tall. The disabled and children under 1 metre are free. You can also get consecutive day tickets, evening tickets and season cards. This is part of Canevaworld resort and is located just north up the road from Gardaland, in between Pescheira del Garda and Lazise. It's an exciting tropical island park with everything to do with water, including water rides and slides, pools, white-sand beaches, a fishing village and more! There are also restaurants and places to relax around the island. Highly recommended if you love water and it is probably our favourite of the Lake Garda theme parks when the weather is hot! Prices are listed below under Canevaworld. Here are the opening hours for 2007: Open from 19th May to 30th June, and from 1st September to 16th September 10am to 6pm. Open between 1st July and 31st August from 10am to 7pm. Part of Canevaworld resort, this is a fantastic park that has a variety of stage sets and shows, special effects and stuntsmen. 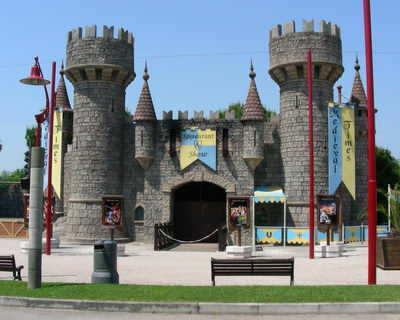 It's located just north up the road from Gardaland, in between Pescheira del Garda and Lazise. To name just a few of the attractions, there's Terminator 2, The Legend of Zorro, the Rambo Action show, and the Cartoon Network...lots of variety and fun for all! Prices are listed below under Canevaworld. Here are the opening hours for 2007: Open from 31st March to 30th June and from 1st September to 30th September, and again during weekends in October up until the 31st October from 10am to 6pm. From the 1st July to the 31st August it's open 10am to 7pm. During Saturdays in July and August it's open 10am to 11pm. A fun day and one of the top Lake Garda theme parks. Canevaworld is made up of two parks: Aqua Paradise Park and Movieland Studios. There is also a Medieval Times Restaurant & Show well worth going to, and make sure you check out the Night Festival, which goes on during July and August. Here are the prices for Canevaworld: 1 Day, 1 Park is 21.00 euros (18.00 euros*) 2 Days, 1 Park is 27.00 euros (23.00 euros*) 2 Days, 2 Parks is 33.00 euros (27.00 euros*) *Price for those under 1.4 metres, disabled, or over 60. Under 1 metre is Free. 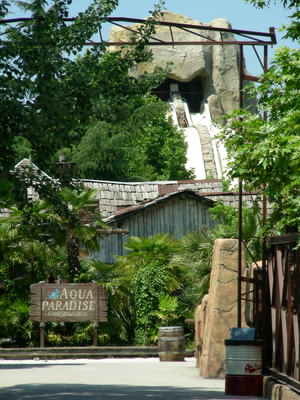 There are also group discounts and annual passes available for these Lake Garda theme parks.